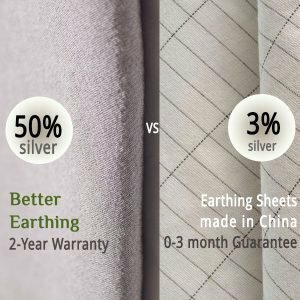 Now, more than ever, there are many choices in earthing bedding from different earthing sheet fabrics to product designs. Earthing bedding contains conductive fibre to conduct free electrons from the earth. Silver fibre is commonly used for this purpose. 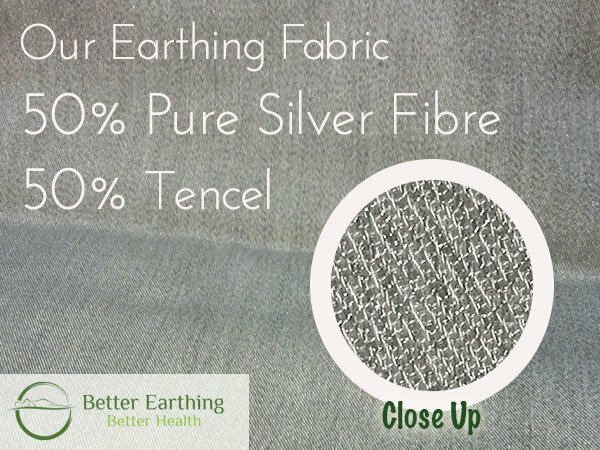 Silver fibre has the advantage of superior conductive qualities for earthing, plus antibacterial qualities for hygiene. It is made by adhering 99.9% pure silver to a nylon fibre core. The technical name for this is ‘silver coated fibre’. The main weakness of silver coated fibre is it is delicate and easily damaged by sulphur in sweat and the myriad of ingredients in creams & lotions. These can damage (oxidise) the silver by weakening or destroying its conductivity and earthing effectiveness. As a manufacturer, we’ve made it our mission to combat this. Quality of the conductive fibre. Our silver coated fibre is of the highest quality, and from France. It is finished with an anti-oxidising process to ensure a longer effective earthing life and more resilience against damage from oxidisation. Undersheet design. Placing your earthing sheet under your existing fitted sheet shields the delicate silver from sulphur in sweat. An undersheet also requires less washing, which in turn means less wear. Quantity of the conductive fibre. Our undersheet contains 15-20 x more silver than regular earthing sheets. That is why you can use it as an undersheet. It is also why we can give a 2-year warranty on the effective earthing life our undersheets. As mentioned above, silver coated fibre is coated with silver that is 99.9% pure. But you really need to know how much silver coated fibre is in the fabric. For that, you need another percentage. 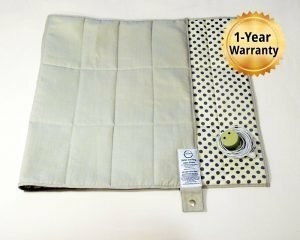 For example, USA made small deep sleep pads are being promoted in Australia as “100% silver conductive fabric (or pads)“. 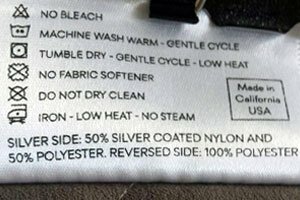 They are actually made from 50% ordinary silver-coloured polyester and 50% silver coated fibre as you can see from the care label. If you can’t find the actual fabric breakdown on the retailer’s website, contact them to confirm how much silver is actually in the product. Earthing fabric is made by weaving silver coated fibres with other fibres, such as cotton, polyester, or in our case Tencel. We chose Tencel for its strength and award winning environmentally friendly production process. The percentage of fibre types in earthing sheets varies. 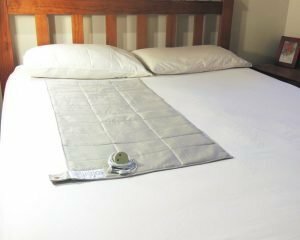 Standard earthing sheets that you have to sleep directly on are made from 97% cotton and 3% or less silver coated fibre. You can see the silver within the distinctive criss-cross or grid pattern if you look very closely. Our products are made with silver coated fibre and Tencel in 50 / 50 proportions. Every single thread of Tencel in our fabric has silver coated fibre twisted around it. Every square meter of our custom fabric contains over 7,500 metres (7.5 kilometres) of silver coated fibre. How Much Silver Fibre Do You Need? We’ve experimented with a variety of fabrics that have silver fibre in 35%, 45%, 50% and 60% of the overall fabric. All of these are highly conductive for earthing and we didn’t notice any difference in earthing effectiveness. We settled on 50% so we could have silver twisted around every single fibre of Tencel in our fabric. The extra silver also acts as a buffer against oxidisation. 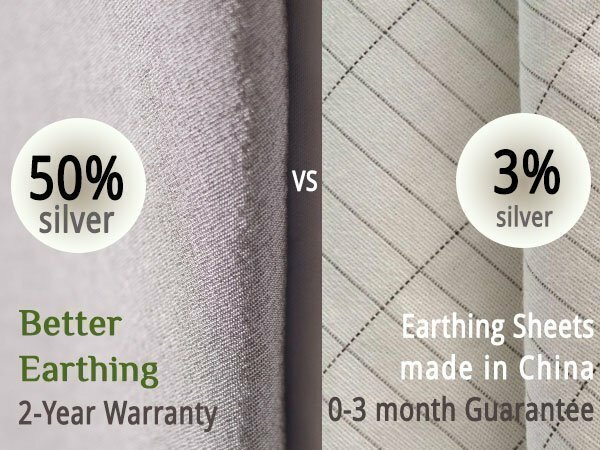 Our innovative earthing undersheet is the first product to use 15-20 times the silver of a standard earthing sheet (where 3% or less of the fabric is silver coated fibre). 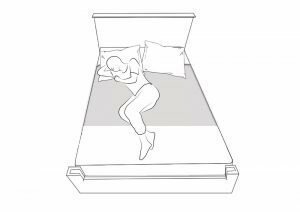 We find it more practical to have an earthing underlay or undersheet, that sits directly underneath our regular fitted sheets. You can still use your favourite sheets. There is much less ‘wear and tear’ on the earthing underlay due to less washing and less body oil build up on the silver fibres. 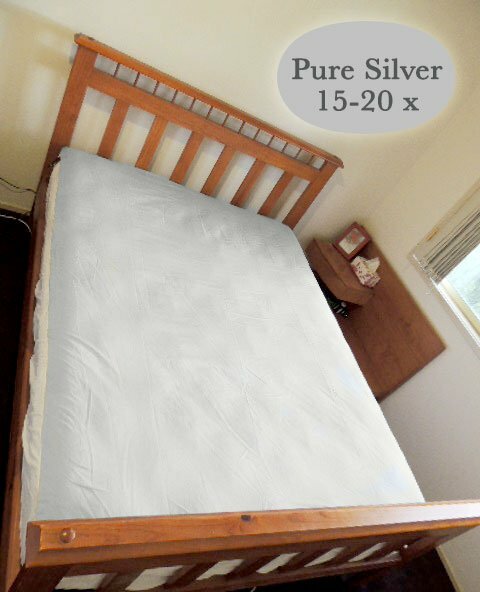 Your regular cotton fitted sheet helps protect the silver conductive fibres from sulphur in sweat, body oils, and the myriad of ingredients in creams and lotions that can damage silver. 15-20 times more silver means far more tolerance to body oils and lotions coating compared to 3% silver earthing sheets. These combined make for an easier earthing experience and a longer-lasting product. Wondering how the earth’s free electrons travel through your regular fitted sheet to you? 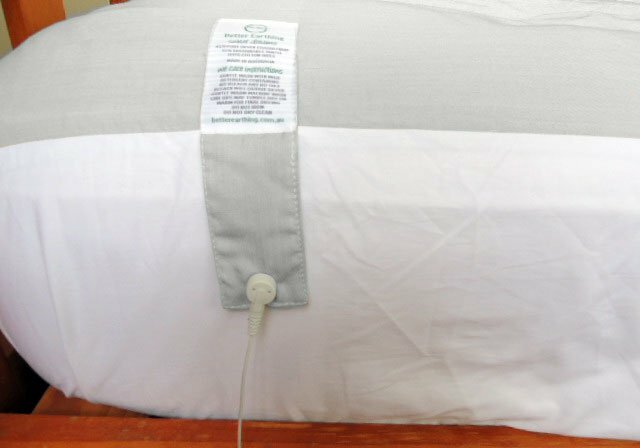 Conductive channels are created in your normal bed sheets via the slightest of body moisture or humidity. The earth’s free electrons travel through these conductive channels from our highly conductive earthing undersheet. Your body weight compresses the sheets turning these conductive channels into superhighways. You can verify this with an autorange multimeter or see our video below. Our earthing sleep system gives up to 100x reduction in A/C voltage through jeans, t-shirt and regular fitted sheet! We recommend that you use your earthing underlay with fitted sheets made from natural fibres like cotton, bamboo, Tencel etc, and contain little or no synthetic fibre like polyester. Natural fibres absorb moisture easily, making them better conductors of free electrons. Earthing sheets are not like regular cotton sheets. A regular bed sheet will last for years before it develops obvious signs of wear such as holes. Earthing sheets only last as long as they remain conductive. If conductivity fails, you have an expensive earthing sheet that no longer works for earthing. This can happen in months with no visible signs. Many things can cause a loss of conductivity such as sulphur in everyday sweat to incorrect washing. This is just one reason why it is important to choose a high-quality product that is designed to last and is backed by a warranty on its effective life. You can read our warranty. Fortunately, you can easily test the conductivity of your earthing sheet with a multimeter. If you find that daily earthing improves your arthritic pain, autoimmune condition, sleep or circulation, you may also find that the benefits of earthing can decrease or even stop if your earthing sheet stops working. That’s because earthing is not a cure. It is a lifestyle practice for optimal health. Find out more about earthing for health and how free electrons act like antioxidants in our body. Be sure to get a warranty in writing that your earthing product will earth effectively for a fair period of time. We give 2 years on our undersheets, and like any product with a warranty, it should last longer when cared for. That way, you won’t experience a disruption of the health benefits of earthing. 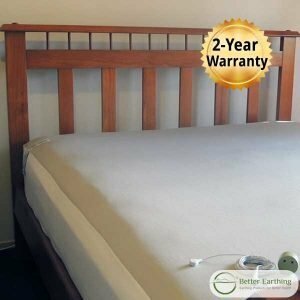 View our innovative earthing bedding in the better earthing shop.